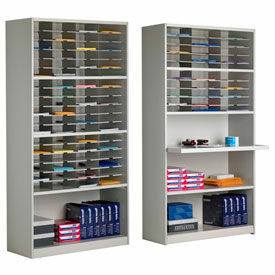 Datum Literature Racks, Tables And Consoles Are Designed For Organizing And Sorting In Office Mailrooms, Schools And More. Datum Literature Racks, Tables And Consoles can be combined or used as a stand alone to serve various office or administrative sorting and storage applications. Components are made of heavy gauge steel, PVC edging and hard laminate tops for long lasting durability. Available types include Console Tables, Machine Tables, Legal and Letter Size Literature Racks, Mail Master Workstations and Sort Modules, and Oversize Literature Racks. Frame colors are Black and Medium Gray. Top colors are Desert Dusk, Regal Cherry, and Sapelli Mahogany. Dimensions vary per model. 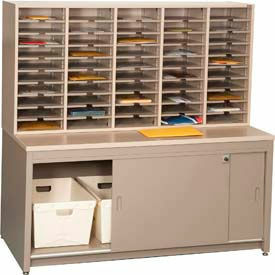 Safco® E-Z Sort® Mailroom Furniture Is Used For Providing Efficient And Flexible Mail Sorting Station Designs. 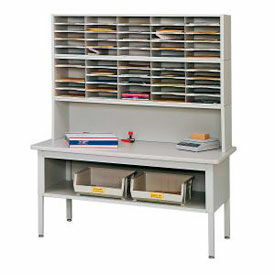 Safco® E-Z Sort® Mailroom Furniture is solidly made for long lasting durability and dependability. Combine separate modular components to design work station that best meets particular sorting needs or application. Various Frames, Bases and Risers are available in gray or black powder coated steel. Sorter Modules are available in all steel or steel and plastic tray construction. Table Tops come in black, cherry or gray finished furniture grade particleboard. Additional Mail Trays for use with sorting modules also available. Marvel® 30 Compartment Mail Sorter with Adjustable Work Surface Is Used For Organizing Mailroom Areas. 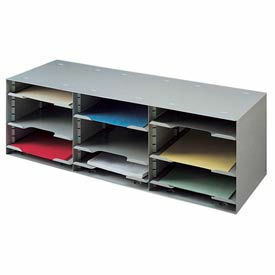 30 Compartment Mail Sorter is made of laminate and metal for long lasting durability. Shipping table is modular so it can be customized to support meter machines, scales, printers and more. Can be ordered with multiple options including risers and adjustable shelves to accommodate larger envelopes and packages. Lockable cabinet also available. Worksurface adjusts from 24.5" to 39.5" high in 3" increments. Worksurface measures 39"W x 25"D. 30 sorter pockets. 2 under worksurface storage shelves. Overall dimensions are 42 in W x 16 in D x 80 in H. Available colors are Slate Gray or Black. Sorting Racks Are Perfect For Any Size Literature Including Binders And Files. Versatile racks are made with recycled steel. Includes height adjustable shelves that adjust at 1" increments. Built-in recessed on top allow stacking of multiple units. Measures 11-1/2"D x 10-1/4"H overall. Extra Shelves are available. 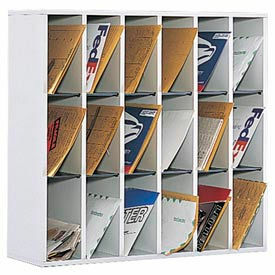 Marvel® Modular Mailroom Furniture Is Used For Organizing Any Business Mail. 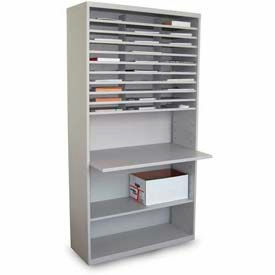 Modular Mailroom Furniture is made from heavy duty steel for strength and long lasting durability. Conveniently modular, laminate mailroom sorter supports meter machines, scales printers and all other specialized equipment to meet the needs of any work environment. Safco® Wooden Mail Sorters Are Used For Organizing Mail Or Other Multiple Office Correspondence Applications. afco® Wooden Mail Sorters are made of solid 5/8 inch thick compressed wood with laminate finish for long lasting durability and dependability. Include adjustable hardboard dividers for customizable compartments. Solid fiberboard back provides stability. Black plastic molding acts as a label holder. Can be stacked 2 high. 18 or 36 Compartment sorters measure 33-3/4 in. W x 12 in. D x 33-3/4 in. H and are available in choice of Black or Gray color finish. Easy assembly. Paper Folding Machines Are Used For Mailrooms And Offices Requiring Folding Applications. Pressure Sealers are made of metal and plastic for long lasting durability. Variety of types available to suit job size and fold requirements. Automatically fold sheets of paper quickly and evenly for professional fold of literature, brochures and pamphlets. Helps reduce down-time and increase productivity. Sheet capacities are 20, 150, 200, 250 and 500. Color is Gray. Sizes and speeds vary per type. 3 Month Limited Warranty on Formax models. 1 Year Limited Warranty on Martin Yale® models. 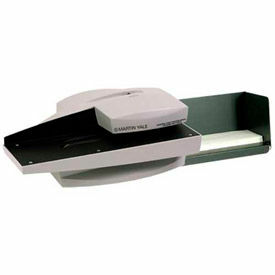 Envelope Openers Are Used For Businesses, Mailrooms And Offices Requiring Opening Of Incoming Mail. Envelope Openers are made of plastic and metal for long lasting durability. Hands-free operation. Envelopes get placed into position and user turns on unit. Units automatically feed and open stack of envelopes. Blades fully enclosed to protect fingers. Non-skid feet provides stability. 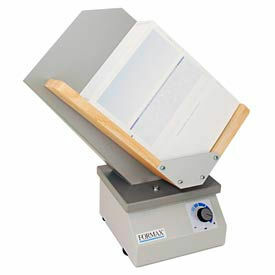 Formax® Envelope Opener allows processing various envelope sizes at once without pre-sorting. 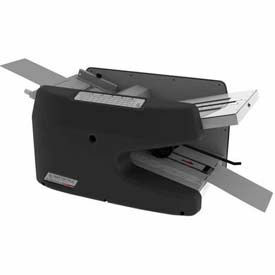 Types are Automatic Mail Opener, Desktop Letter Opener, Envelope Opener and High-Speed Letter Opener. Speeds are 300/Min, 7,000 Envelopes/Hour, 12,000 Envelopes/Hour and 17,500/Hour. Color is Gray. Sizes vary per type. 3 Month Limited Warranty on Formax models. 1 Year Limited Warranty on Martin Yale® model. Mailflow-To-Go sorters, cabinets and desks are the perfect solution for smaller organizations needing a functional mail center. These economical options can be configured to the demands of any business! 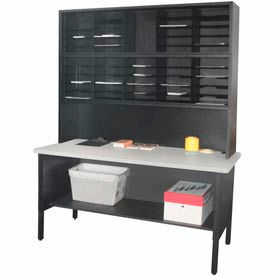 Easy to aasemble cabinets, sorters and desks offer efficient organization. Functional mail centers for medium or small operations.